We barely finished the turkey and people are lighting up their Christmas trees! This is when you know the holiday season is here. The stores are now filled up with ornaments of every color, sparkling reindeer, stars, silver and gold leaves, scented candles, socks and what not! While people are busy shopping for the loved ones and decorating their house with Christmas tree and ornaments, we are here in the flower district making sure the city, hotels, building, stores and your home are all beautifully decorated with festivity. Our store, Mahir floral and event designs is now bustling with Christmas tree, red and white poinsettias, Magnolia wreaths, Christmas greens, paper white plants, branches and all the other holiday plants and flowers that you can possibly think of! 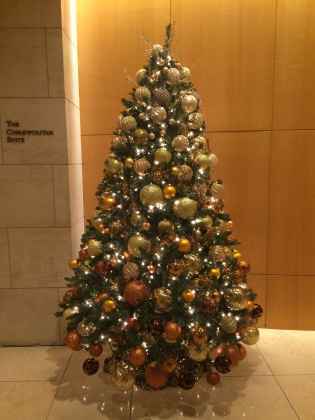 We all are familiar with the basic green, white and red color theme of Christmas – but sometimes it can be monotonous. 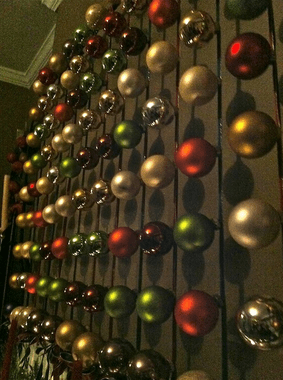 Sometimes you need a little change, little out of the box ideas to make your holiday decoration eye catching and outstanding. So, this holiday season I have gone through several websites, blogs, articles to gather some new concepts and I have put together a few interesting and fun ideas for my readers. So here goes some ideas that might set you apart from the traditional decor. I think this is a pretty cool idea for a blank wall space. Now thinking about it we can actually also do an ornament curtain against window may be! 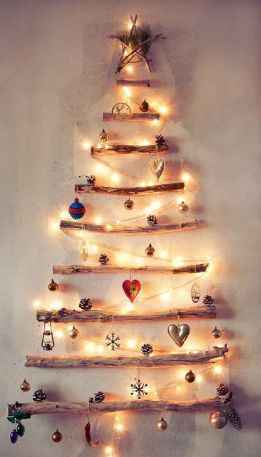 This Christmas tree impression with the wooden branches used as shelf I think is brilliant! You can possibly hand made those cute little hangings and give your home a warm cozy Christmas feel. 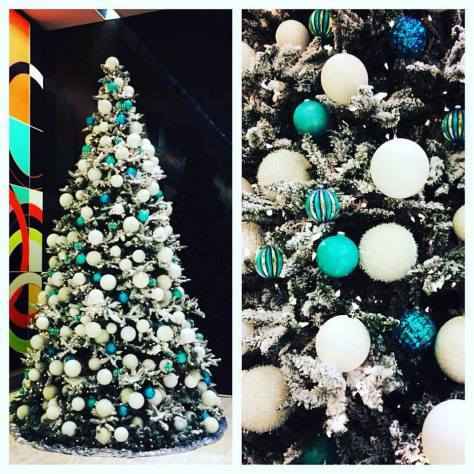 A blue, white and silver tree is not something you see often but it has an undeniable harmony with the season and snow! I loved the theme and you can basically do any preferred color and make it as unique as your imagination. 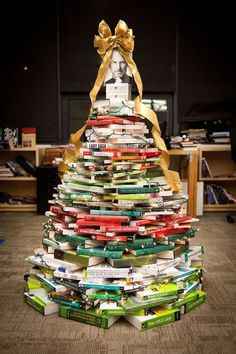 This probably isn’t exactly a festive look but this could be a heaven for book worms; a Christmas tree made out of their favorite books? It surely is different! How about a tree with branches and no greens? Well it doesn’t look as bad as it sounds! 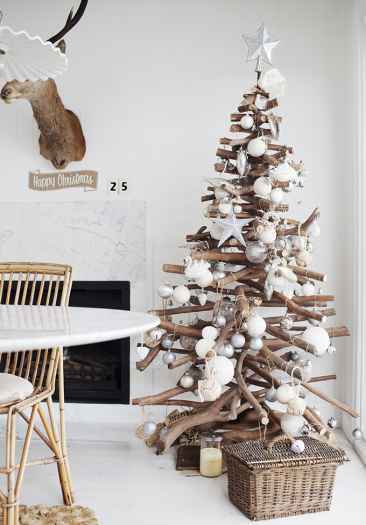 This wood Christmas tree with white and silver ornaments can be a great fit for a contemporary space. It’s unusual but strangely captivating. Enough of the Christmas trees! 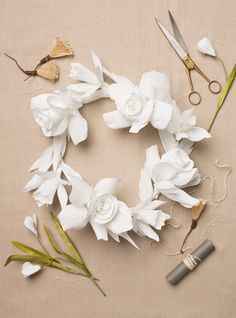 Let’s take a turn and see how can we make things different with our very popular wreaths. I found the colors and texture of this particular wreath very fascinating. 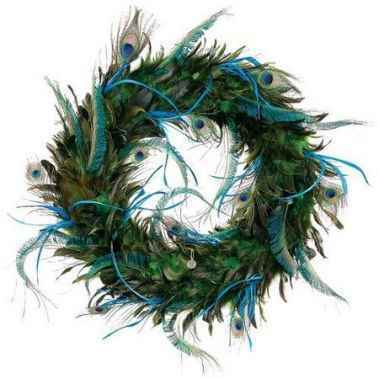 It has a soft touch to it unlike the usual green wreaths of rigid structure. The paper wreath can be a fun project for children and an exciting addition to your holiday decor. It might not be the easiest DIY project but you can always tweak things, make it easy, engaging and fun! This vivid blue wreath caught my attention in pinterest. The color hue here is gorgeous and the spray painted pine cones looks amazing. 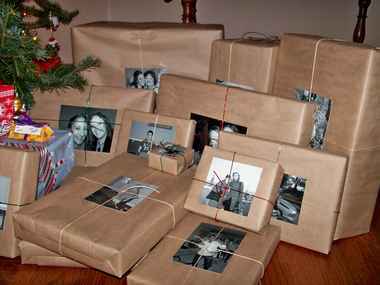 Using photos can be an entertaining way to direct your gifts instead of putting name tags. 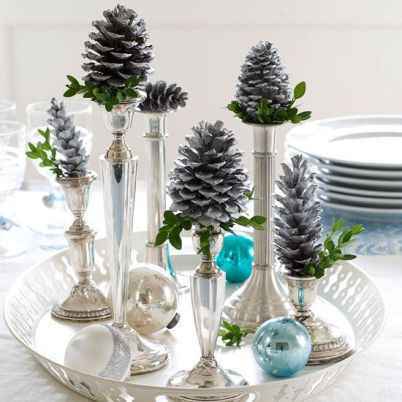 Pine cones for the table ! The painted silver pine cones on the stand clearly can be a nice center piece for the table spreading seasonal holiday vibe. These indeed looks very polished and appalling with the touch of green peeking from the sides. And last but not the least the door! We often stay on put after decorating the outside with Christmas lights and forget about inner side of the door. 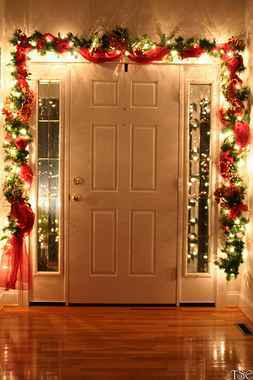 Let’s not neglect the indoor and light it up around the door frame to spread the festivity all the way. 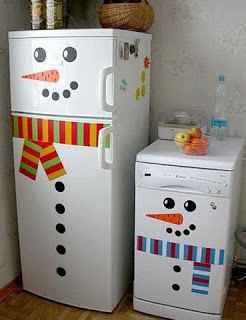 A big part of holiday is decoration. There will be always new ideas, different ways of doing things, popular trends etc. but most importantly holiday is about getting together with family and friends, enjoy the fun part of decoration, food and celebrating the season…with that note Happy Holidays everyone!